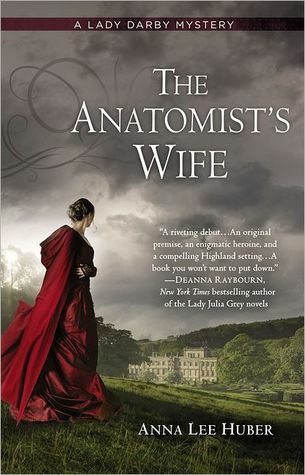 Kiera wants to put her past aside, but when one of the house guests is murdered, her brother-in-law asks her to utilize her knowledge of human anatomy to aid the insufferable Sebastian Gage—a fellow guest with some experience as an inquiry agent. While Gage is clearly more competent than she first assumed, Kiera isn’t about to let her guard down as accusations and rumors swirl. It took a little while to get into the book, as the first couple chapters were sort of slow-paced, but once the story got going, I pretty much got sucked in. The writing is absolutely wonderful, and the descriptions lend a beautiful atmospheric presence to both the castle and the highlands. There were some points in the book where I might have rolled my eyes or gotten frustrated, but ultimately, those moments paled in comparison to everything else I liked about the book. I liked how Lady Darby was quick, level-headed, and resourceful, even in spite of a few times she might have made a few poorly judged decisions about her own safety and her own investigations. I liked how Sebastian Gage was not made out to be a completely, all-knowing, perfect, yet broody rake--though aside from that, he truly didn't really do much for me aside from be non-standard. The mystery itself was quite twisty, though at some points pretty predictable, such as the obviousness of some of the red herrings thrown out there. Meanwhile, if this book had also been intended as a romance, I'm not sure I quite felt the chemistry between Kiera and Gage. I'm not even sure they partnered all that well investigating the murder together, either, and a lot of the "tells" that Kiera kept mentioning seeing from Gage had to be deliberately mentioned repeatedly, as if trying to convince herself more than anything how well she knew Gage after only a couple days of acquaintance. Otherwise, this was an extremely intriguing and strong start to this series, and I look forward to the next book already. I actually appreciate the slow burn approach that I'm sure the romance will take, and am glad that the "I love you" declarations are nowhere in sight for this first book. Of course, it might also be because I couldn't quite feel the romance, though there is still room for development there. I particularly like that Kiera isn't completely alone in the world, and that she is at least surrounded by some good people, especially her sister and brother-in-law. I hope to see more of them as well. I wish there were a few more positive friendships with Kiera, especially with the women in the book. I understand the reason why Kiera is ostracized, even if I don't like it, but that was just how I suspect life was like for all women during that time period. Gossip, scandals, and anything out of the norm can really do a number on your reputation, and Kiera, being a rather introverted person who doesn't seem to care to defend herself or speak up for herself is more likely to face more gossip and scandal. Then again, speaking up for herself will probably get her trolled by the rest of the ton... so, it's a lose-lose situation, no matter what. Sad. Meanwhile, one particular character kind of stood out to me: Marsdale. I'm not sure how to explain my completely ridiculous, yet intriguing interest in this particular scoundrel. A jackass and rogue he may be, but somehow I found I appreciated how easily he saw through everyone's outward facades, and how he seems to call out, rather bluntly even if tactlessly, all the obvious truths and open secrets around. I disliked him to the extreme at first, and I'm not quite sure I even like him much (nor if it will matter if he's just a supporting character in this first book, and we'll never see him again), but he stood out.